The Narrow Gauge Trail was a road about four feet wide that connected Illinois Valley with Brookings through the area we know today as the Kalmiopsis Wilderness. Additional construction resulted in a spur road to Pearsoll Peak Lookout. These road are now collectively called the Chetco Rim Trail. Construction began in 1939 with one crew building the road from Illinois Valley and another building from Brookings. Construction was completed in 1941. The Illinois Valley section started at the Wimer Road about 14 miles from O’Brien and followed present-day USFS Road 112 past Mud Springs, Rough & Ready Lake to Doe Gap where it turned west toward Chetco Peak and Vulcan Peak. 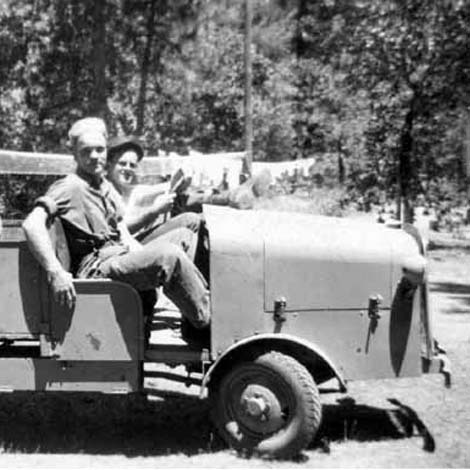 A 1941 article mentioned that Don Cameron, an engineer for Siskiyou National Forest, was the project manager with Marvin Ramsey as the foreman. 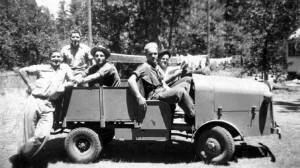 Crew members included Peter Solo, Leo Hassler, Frank Bucheit, and Buster Branham. 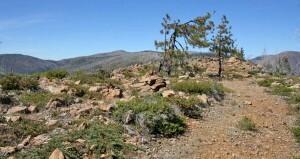 The old Narrow Gauge Trail follows a ridge near Mud Springs before turning to follow the distant ridge line seen along the left horizon. Click image to see an enlargement. The original purpose of the road was to provide rapid transportation for firefighters into the wilderness. 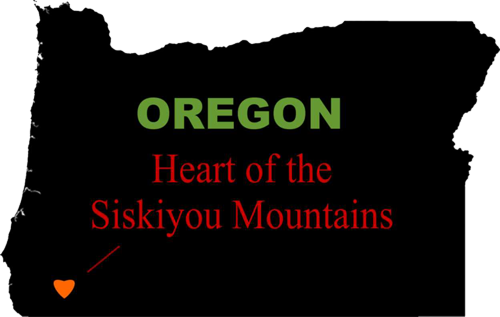 However, two years after the trail was completed, the Siskiyou Smokejumper Base was established near Cave Junction, which offered a much faster method of delivering firefighters with aircraft and parachutes. 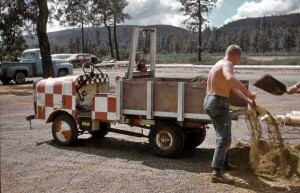 The narrow gauge truck was given to the smokejumper base and used by crews for general work around the base. This photo shows some of the smokejumper crew in the narrow gauge truck at the Forest Service headquarters in Cave Junction. Photo by Gillin Chalmers, 1944. Click image to see an enlargement. The last known location of the narrow gauge truck was at the Siskiyou Smokejumper Base in 1962. It is uncertain what happened to it after that time. 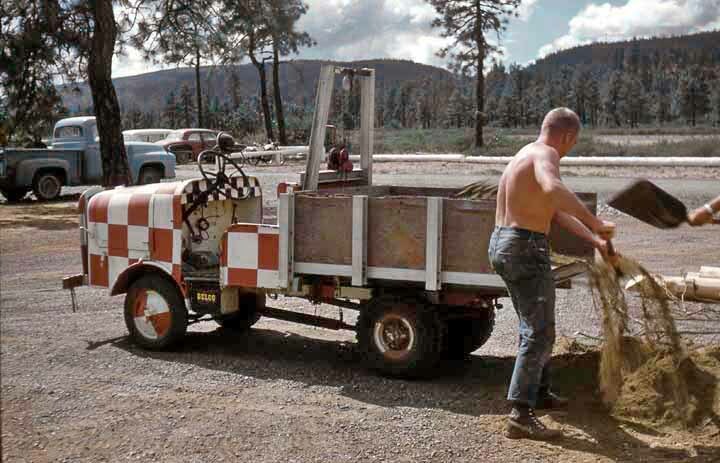 The narrow gauge truck was used by smokejumper crews at the Siskiyou Smokejumper Base. Photo by Doug Beck, 1962. Click image to see an enlargement. Similar “narrow gauge trucks” were used as early as 1925 for hauling chrome ore from mines on the High Divide in California, a couple of miles south of the Oregon border (see Root, 1925). The road that was used by these vehicles is now known as the Diamond Creek Road. No photos of these vehicles nor information where they were built has been found. If you have additional information about the narrow gauge trucks, where they were built in Grants Pass, or photos of the trucks being used in mining operations or on the Narrow Gauge Trail (Chetco Rim Trail), please share. Root, Lloyd L., 1925. Report XXI of the State Mineralogist,California State Mining Bureau, San Francisco, California, p286. 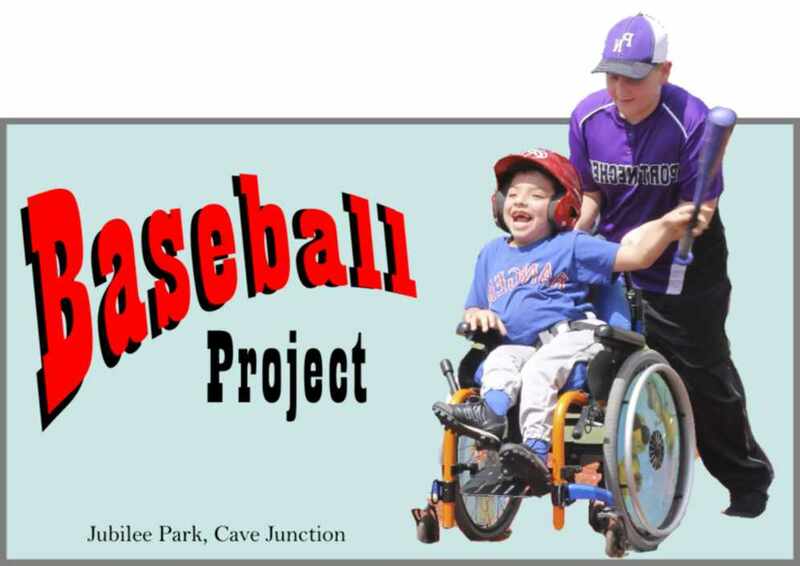 Get involved in changing the community’s future.